The Daily Struggles of the Domestic Un-Goddess: the other red meat? So to say I'm leery of 'alternative' animal proteins is more than fair. 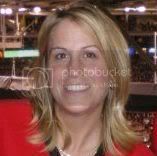 But that said, I've also made no secret of the fact that I'm super leery of most modern farming practices. In fact, they make me sick. Really, really sick (some fun education material here: Toxin by Robin Cook, a novel I read at the tender and impressionable age of 18...it turned me off almost all meat for a couple of years, so it's not for the weak of heart; for a little less time investment, you could watch Fast Food Nation, a somewhat diluted look at the farm in terms of factory, and of course, there is always the fabulous (and only five minute) Meatrix exploring the vast wrongdoings of industrial agriculture). All that to say that it's a huge breath of fresh air when there is a local farmer doing something a little different...something that is humane, environmentally sustainable and healthier. How can you go wrong? And what is this magic meat? It's elk. Not too far from where I live is a fabulous elk ranch, hidden away admist trees and forest, where you'll find naturally-raised, grass-fed animals. I'm not going to go too much more into the details of the elk themselves, as that's the topic for this week's FoodTV post (will post link when it's posted), but suffice to say, this is a great alternative to beef. BAHAHAHA. 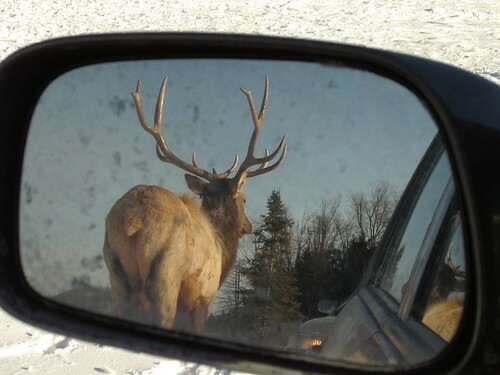 Anyway, that was my past acquaintaince with elk. I'd definitely never eaten it and was more than a little terrified of it. I'm a very glad to say that it was a wholly positive experience for all involved (except, perhaps, the, uh...elk) and that I would definitely recommend everyone try it. The ranchers, Fay and Thom, are lovely people who can be found weekly at both the Carp and Lansdowne Farmers' markets. So what are you waiting for...go find them! It's tasty and even I, who really am not interested in game-y meats, really enjoy it. 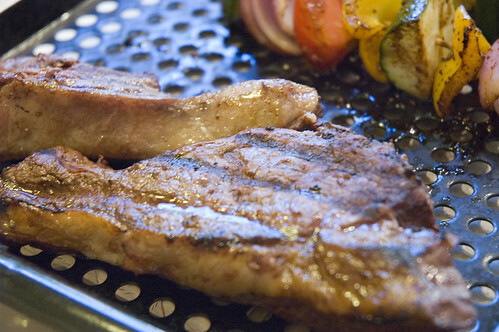 Grill elk to medium-rare (2-3 minutes per side) and let rest for 5-10 minutes. 1. 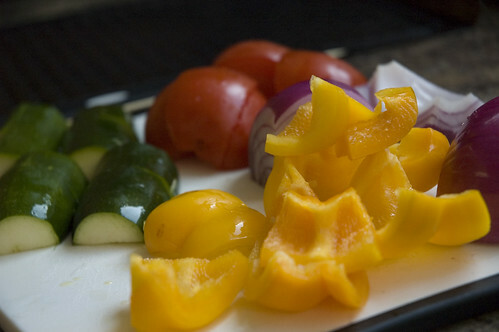 Cut vegetables very coarsely (into sizes you'd want to put on a skewer!). 2. 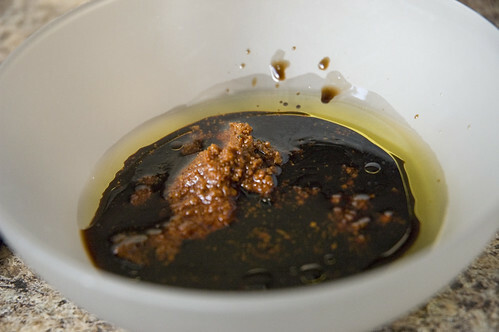 In a small bowl, combine oil, vinegar and curry paste. 3. 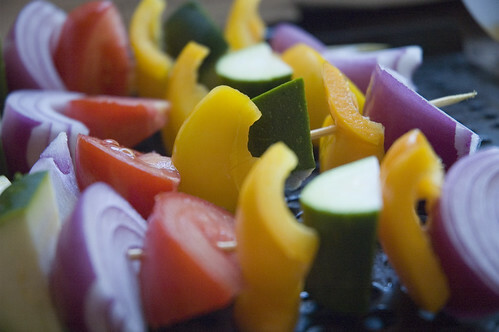 Thread veggies onto skewer. 4. Brush with glaze and grill to desired doneness. (you can continue to baste them as they cook - it will be even yummier). The balsamic vinegar imparts a nice tangy sweetness. 1. Wash, dry and chop lettuce. 2. 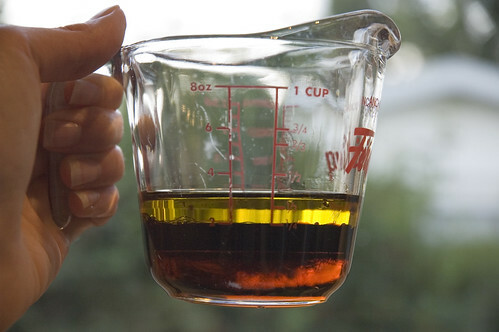 Combine vinegar, oil, maple syrup and mustard. 3.Taste the dressing and adjust if it's not to your liking (if it's too sweet, add either some white vinegar or more mustard, if it's too acidic, add a little more oil). 1. Dress plate with lettuce. Arrange veggies on top. 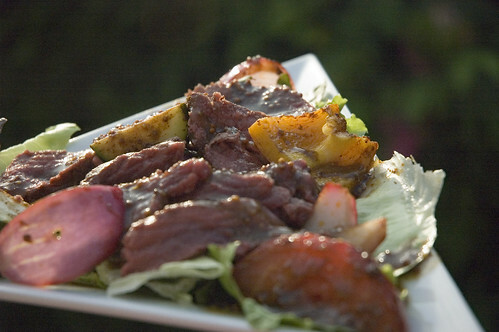 Top with slices of grilled elk and drizzle vinaigrette over top. Mmmmmmmmmmmmmmmmm......this was a wonderful, and slightly indulgent-feeling meal. A great match with a bold red wine. Speaking of "game meat", I know you probably don't get reindeer in Canada, but if you ever, by some miraculous way, get your hands on cold smoked reindeer, try it. Seriously. One of the best things in the world. 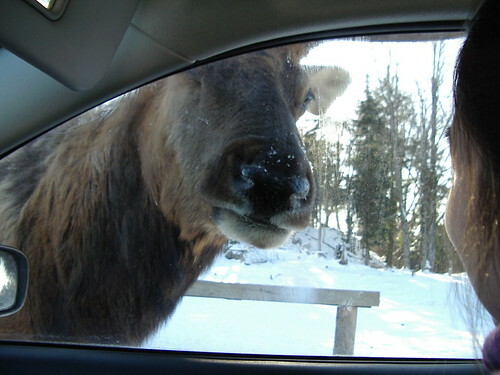 I love LOVE that picture of the elk looking in the car window! Very cute site.